In June 2012, the Morwell River surged and a levee collapsed allowing the river to flow into the open cut coal mine which supplies the Yallourn power station. To avert a power supply crisis to the state of Victoria, the urgent diversion of a river through a pipeline needed to be implemented. The flooding caused US$400m of damage to infrastructure and put 25% of the state’s electricity supply at risk. A rapid response was required to divert the river, dewater the coal mine and reinstate coal supply to the power station. Alkadyne® HDF145B was used to construct the pipe that was used to divert the river flow due to its fast extrusion, large diameter capability, adaptable installation techniques, high integrity welds, abrasion resistance and flexibility. 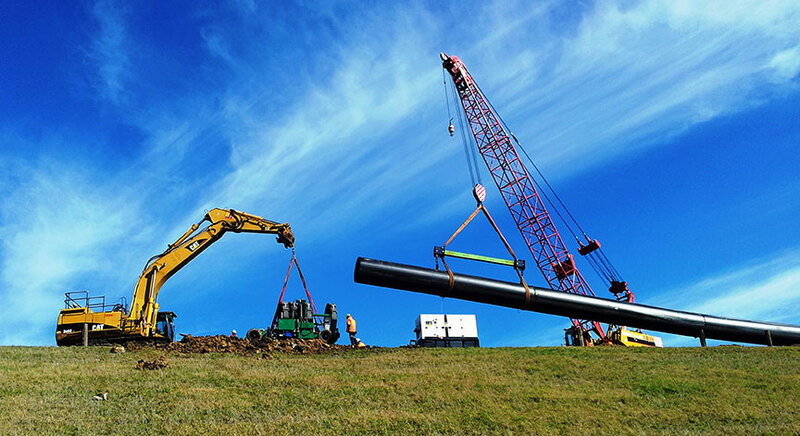 To complete the project 4km of 1600mm diameter PE100 pipe was manufactured and delivered to site. Pipe welding equipment was air freighted from the USA and commissioned. The pipeline installation involved welding ten lengths of pipe into 120m strings which were then dragged to the installation site for final joining. The tie-ins were complete and the pipeline was commissioned in time to keep the power station operating. The entire Morwell River was then flowing through the pipeline allowing repair of the mine. The timeline of the project applied significant pressure on all parties involved and positively revealed the outstanding capability of the Australian pipe industry to respond to such a crisis. The project took just over 2 months to re-establish the diversion of the Morwell River as a semi-permanent solution which kept the mine fully operational. This ensured an uninterrupted supply of power to the people of Victoria and prevented a prolonged interruption to the state’s economy. The supply chain in this project begins with Qenos as a domestic supplier of quality PE100 pipe compound. Combined with the exceptional pipe manufacturing capability of Iplex Pipelines and welding expertise of GEM Industrial Services, it became possible to respond rapidly in order to contain and avert a major crisis. Alkadyne HDF145B provided a unique package of performance attributes such as the capacity to manufacture pipes of very challenging sizes, withstand significant abuse resistance during installation and ensure the structural integrity of the pipe network for long-term use.